Amazon has the Plantronics Discovery 975 Bluetooth Earset for the Bottom Low Price of $79 with no tax and free shipping. Ingeniously simple. That's the Plantronics Discovery 975 Bluetooth earpiece. Blending easy connectivity with dual-microphone, noise-canceling AudioIQ2 technology and patented ear tips for a stable, comfortable fit, this elegantly simple earpiece lets you listen clearly and makes you sound sharp, even in noisy environments. With its innovative, rechargeable carrying case that can triple your talk time while you're on the go, you'll wonder why staying connected hasn't always been this simple..
Wireless Emporium has the Jabra BT150 Bluetooth Headset for the Bottom Low Price of $19.99 with no tax and free shipping. The Jabra BT150 is a convenient wireless headset that gives you the Bluetooth? freedom you need for a modern lifestyle. This comfortable, compact headset pairs up with Bluetooth? mobile phone, so you too can start enjoying life hands-free. Rugged and durable, the Jabra BT150 is built with comfort and convenience in mind. Whether youre walking, running, driving or out in town, it will stay firmly placed on either ear. With up to 6 hours talk time and up to 110 hours standby, the Jabra BT150 will keep going as long as you do..
Next Warehouse has the Linksys WRT150N Wireless Router for the Bottom Low Price of $94.47 with no tax and free shipping. More Speed. More Range. More Affordable. The Wireless-N Home Router is really three devices in one box. First, there's the Wireless Access Point, which lets you connect to the network without wires. There's also a built-in 4-port full-duplex 10/100 Switch to connect your wired-Ethernet devices together. Finally, the Router function ties it all together and lets your whole network share a high-speed cable or DSL Internet connection..
Buy.com has the GE 25829GE3 5.8 GHz Cordless Phone for the Bottom Low Price of 16.83 with no tax and 46.99 for shipping. Conversation made simple. This analog cordless phone from GE lets you roam your home or office wire-free. 5.8GHz technology with 40-channel auto scan selects the clearest channel, so you get the best reception available. Its 10-number memory keeps your frequently called numbers at the ready, and one-touch redial makes it a snap to call that last number back.. The AIRcable Industrial and the XR are our flag ship products. 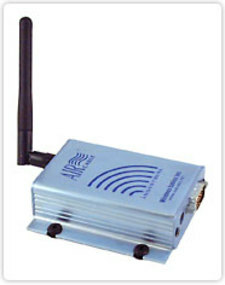 Designed for wireless sensor interface, mesh networking and data logging applications with an RS232 port interface. These products are built for outdoor use where autonomous operation, flexible communication and long-range are important features. These compact Bluetooth® compatible products gather data using intelligent sensors, run computations, transfer files, and communicate using secure, long-range Bluetooth to multiple partners simultaneously. Programmable and configurable over the air, these units can be clustered together to create low-power, high-efficiency communications networks that interact with other AIRcable products as well as all Bluetooth compatible devices such as PCs, cell phones, and PDAs. Amazon has the Linksys WRT54GS Wireless-G Broadband Router with SpeedBooster for the Bottom Low Price of $56.1 after $10 rebate (expires 10/14/06) with free shipping. The Wireless-G Broadband Router with SpeedBooster is really three devices in one box. First, there's the Wireless Access Point, which lets you connect Wireless-G, Wireless-B, and other performance-enhanced SpeedBooster devices to the network. There's also a built-in 4-port full-duplex 10/100 Switch to connect your wired-Ethernet devices together. Finally, the Router function ties it all together and lets your whole network share a high-speed cable or DSL Internet connection. The Wireless-G Broadband Router with SpeedBooster incorporates the next generation of Wireless-G (802.11g) networking. SpeedBooster technology is a compatible add-on to standard Wireless-G, which increases "real-world" wireless network performance by up to 35%..
Buy.com has the Sony Ericsson HBH-PV700 Bluetooth Earset for the Bottom Low Price of $29.99 with free shipping. Have you ever tried taking notes during a phone meeting, taking a call while driving, or using your phone's keypad when communicating with automatic voice systems? Then you're bound to appreciate the HBH-PV700 Bluetooth Earset, a wireless solution that leaves your hands free. A wireless headset makes call handling a breeze. When you get a call, you don’t have to reach for your cell phone. Just press the answer button on the outside of your headset and regulate the volume with the volume buttons. A discreet light indicates the battery status. Enjoy true hands-free freedom with IOGEAR’s Wireless Bluetooth Headset. This ultra-lightweight headset enables you to wirelessly place and receive calls on your Bluetooth cell phone, ending messy and potentially dangerous wire tangles. IOGEAR’s Bluetooth Headset clearly transmits all your phone calls wirelessly to your phone via Bluetooth radio technology. Its stylish and compact design makes it very easy and comfortable to wear. Among its many features are a built-in rechargeable battery for long battery life, easy-to-reach volume control, and earhook for secure wearing.